Sometimes you just need simple because life can get complicated. With two active kids comes two sets of activities – sports, social life, extra curricular – it gets crazy. We have days that require the coordination of a well planned military operation to get everyone where they need to be when they need to be. On those days, I need dinner to be simple. That is where this recipe comes in. 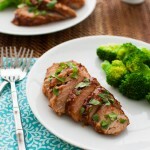 Mix up a glaze (with only 5 ingredients), spread it on the pork tenderloin, roast it, and you are done. If you happen to have a few extra minutes, you can cook up some fresh vegetables or toss a salad together to go on the side. However, if you are short on time and energy, frozen vegetables cooked in the microwave are a great option. Don’t worry, I won’t judge. Remember, we are keeping things simple today. Preheat oven to 350 degrees. Line a rimmed baking sheet or pan with aluminum foil and spray with non-stick cooking spray. In a small bowl, stir together hoisin sauce, ketchup, soy sauce, garlic, and sugar. Put pork tenderloin in prepared baking sheet. Spread the hoisin sauce mixture evenly over the tenderloin. Roast pork in oven until internal temperature reaches 160 degrees, 35 to 40 minutes. Let pork rest 5-10 minutes before slicing. Sprinkle slices with cilantro leaves, if using, and serve. I make a second batch of the hoisin sauce mixture (using only 1/2 teaspoon garlic) to drizzle on the pork for serving. Hoisin sauce is available in the Asian section of most grocery stores.